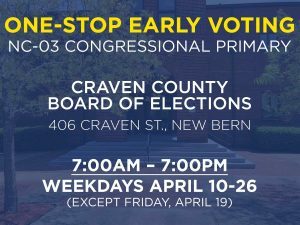 Cast your ballot at one-stop early voting in the 2019 NC-03 special election primary! If you need to register to vote, or update your registration, you can do that at one-stop early voting! Voters registered as Democratic or Unaffiliated can cast a ballot in the Democratic primary.